Wifflefest, the annual tradition at the Southview Grace Brethren Church, Ashland, Ohio (Mark Abel, pastor), kicked off yesterday for it’s 18th year. It continues this week and concludes on Sunday with special speaker, Andre ‘Thunder’ Thornton, a Cleveland Indian Hall-Of-Famer, who played ten of his fourteen seasons in the MBL with Cleveland. Below is a portion of a story about the event from Saturday’s Ashland Times-Gazette. Click here for the complete article. June’s ending and July’s beginning mean only one thing in Ashland each summer — time to play some wiffle ball. Entering its 18th year, Wifflefest has become a staple in the local community throughout the July Fourth weekend. 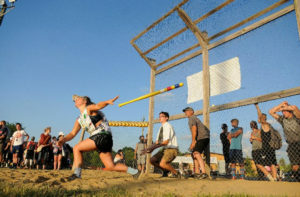 “If people haven’t come and been a part of it (Wifflefest), if they haven’t seen and experienced it, it’s so hard to explain,” said Southview pastor Mark Abel, who has run the tournament since its inception. “You really need to come out and see the community, see the kids. The annual wiffle ball tournament takes place at Southview Grace Brethren Church and begins on June 30.